This started out nonalcoholic. It didn’t stay that way. Peel and pit peach. 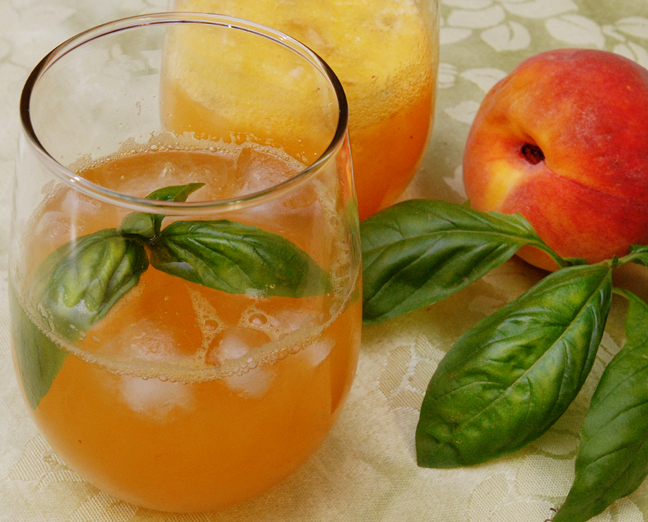 Muddle basil leaves and peach halves in a glass, then dump contents into a strainer set over a measuring cup. Muddle again to get as much juice out as possible. Depending on the size of the peach, you should have about 1/4 to 1/2 cup juice. (You’ll want to adjust the soda water accordingly.) Pour juice, bourbon and simple syrup in a tumbler. Add ice cubes and top with desired amount of soda water. Garnish with a basil leaf. This entry was posted in Spirits and tagged beverages, cocktail, entertaining, fruit, mixed drinks, peach, seasonal, summer. Bookmark the permalink. Great idea to add the Bourbon !! I was wondering – perhaps you might want to explain what “muddle” means for some of your followers who may not know? Another wonderful recipe Rufus!! That is a nice looking peach indeed and an even better looking cocktail. I am stealing your idea and making this in a large batch for a dinner party/potluck that I am attending next week. I will of course give you full credit when everyone loves it! This is exactly what I need. Now. Make mine a double, please.